EVERYTHING FROM ENTERTAINMENT TO ENERGY CONTROL. INTERACTIVE SECURITY TO SMART, NEW CONVENIENCES! Congratulations on your new home! Guardian Home Technologies is here to assist you in maximizing the enjoyment of your new home through full integration of technology and also in preparing your home for many life conveniences. Our technology services include smart home automation (a popular feature for tech savvy homeowners), home theater and sound systems, 24/7 home security monitoring to help protect your new home, smart connections and more. Together, we’ll custom design a technology solution to help you achieve your dream home. When motion is detected, an image is automatically captured and stored. Hide cables behind the wall for a clutter-free entertainment system. Stream your favorite music over Wi-Fi network. Remotely adjust your home’s heat/cool settings. Set an energy-efficient lighting schedule and remotely turn lights on/off. Remotely lock/unlock individual points of entry. Remotely control the garage doors and be alerted if left opened. Identify strangers before opening the front door. and Convenient Online Customer Care Dashboard. Guardian subscribes to the same fine standards that your builder has set in providing state-of-the-art products, professional service and expert workmanship. Guardian has been selected by builders across the U.S. to assist their clients in maximizing the enjoyment of their new home through technology and also in helping to prepare the home for years of future enjoyment. 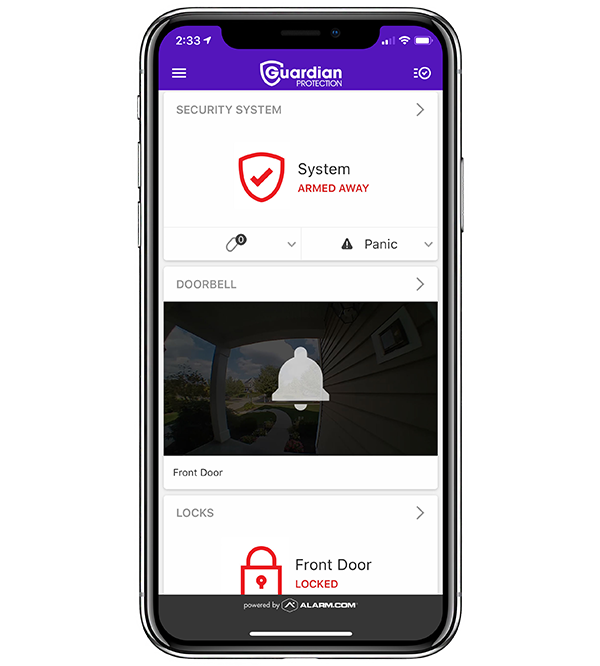 As you become familiar with our website, you’ll see the features that Guardian Home Technologies can integrate into your new home. Your Guardian home technology specialist is available to work with you every step of the way from one-on-one education and selection sessions, to on-site markups for locating your selections in just the right places, all the way to demonstration before usage. We are fully committed to helping you achieve your goals and dreams for living in your new home!